Drive-in pallet racking is one of the best storage solutions for high density pallet storage. 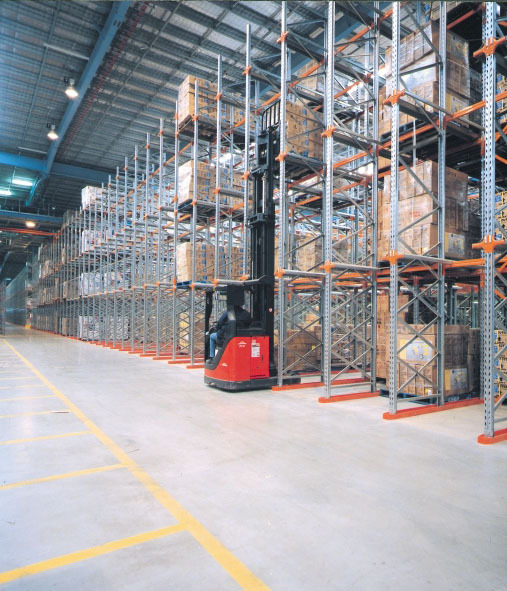 Providing a greater number of pallet positions then standard Selective Pallet Racking means for lower storage costs. This type of pallet racking is also cheaper than many other types of racking for the same amount of pallets that can be stored. Making it one of the most common and sort after storage systems. This kind of storage utilizes a single entrance making it perfect for FIFO or Fist in First out warehouses. Also great for many warehouses that storage a small number of SKU’s but in large quantities. Drive-in racking is best utilized for long term storage or for products that do not have an expiration date. Another great function of this system is it can be turned into “Drive Through Racking”. If you are interested buying Used Drive-In Pallet Racking, please get in touch with our experienced team via our Contact page. Call or message at your leisure. Ware Hows – leading supplier of Used Drive-In Pallet Racking to businesses throughout Brisbane and Australia wide. At Ware Hows, we take great pride in offering our customers the best value in Brisbane for used pallet racking, second-hand warehouse equipment, binning and everything in between.